They say that the eyes are the windows to the soul. In my humble opinion, the same goes true for the headlights in your vehicle. It doesn’t matter if you have an old or new car, or if your vehicle was newly painted. If the headlights look old, dull, yellowed, or oxidized then your car will still look tired, no matter how much wax you apply to the finish or how much tire dressing is on the tires. So if you’ve got tired eyes, you’re need to read our guide to choosing and using the best headlight restoration kit to restore the life to your lights! P.S. You might want to upgrade to some new LED or HID lights too 🙂 Check out our guide to the best LED headlight kit and how to choose an HID upgrade. Modern cars are usually equipped with plastic lenses for the headlights. Over time, the plastic lens will begin to show signs of degradation due to wear and weather exposure. There is no other way to prevent this from happening. The good news is that you can restore them to their former glory using the best headlight restoration kits. My first car was a beat-up mid-90’s Nissan Sentra. It was equipped with glass headlights, so I had no problems with yellowing or oxidation. I remember when my friend bought a used fifth-generation Honda Civic. That car was equipped with plastic headlights and it already had mild oxidation when he bought it. But the headlight lens began to exhibit severe oxidation after a year, and my friend was desperate to find a solution. He was having a lot of trouble seeing in the dark, even when he replaced the bulbs on the headlights. Dull and yellowed headlights will not only make your car look older, but it is a minor safety concern that needs to be addressed immediately. If the above mentioned DIY headlight restoration tips produced average results, then you should try purchasing a commercially available headlight restoration kit. Remember that this is way cheaper than buying a new set of headlights for your vehicle. Very affordable restoration kit that comes with everything needed to clean up those old yellow lights quick! The Turtle Wax Headlight Lens Restorer comes complete with 3 restoration pads with varying degrees of grit to remove deep scratches and severe oxidation on the headlight lens. Also included are a spray lubricant, lens sealing wipe, and the lens clarifying compound. This is probably our favorite of the best headlight restoration kits due to the low cost and very good results. The main thing we didn’t like about this kit was the headlights started oxidizing after about 1 year and a new application was needed. This could have been that we got unlucky in our test, but we found the Sylvania kit lasted longer. But for the price and results, you really can’t beat Turtle wax. The latter is my favorite because using it alone is usually enough to restore the clarity of mildly oxidized lenses. 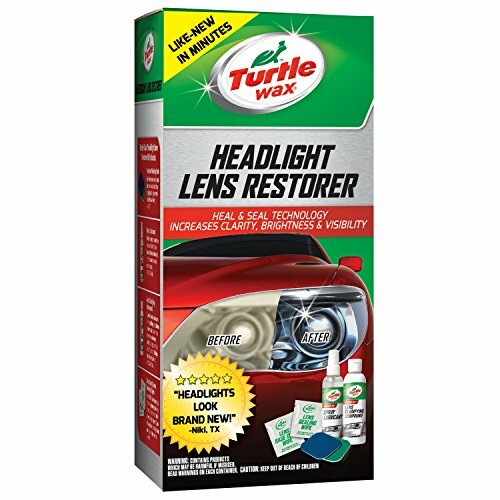 The Turtle Wax Headlight Lens Restorer is designed to remove surface discoloration on all plastic and plexiglass surfaces. This product also employs a 3-step process to remove mild or heavy oxidation. The first step is to thoroughly clean the headlights with soap and water to remove dirt and grime. Next, apply the lens clarifying compound. By this time, mildly oxidized headlights will be quickly restored to their former glory. If this is the case, simply apply the lens sealing wipe and you’re good to go. Total time to get results…. Around 5-10 minutes. Hard to beat that! If the headlights need a bit more work, simply use the spray lubricant and restoration pads to smooth out the problem spots. No sandpaper needed so this kit is great if you don’t want to use a lot of elbow grease! Works fast – 60 second application time – 100% satisfaction guarantee! 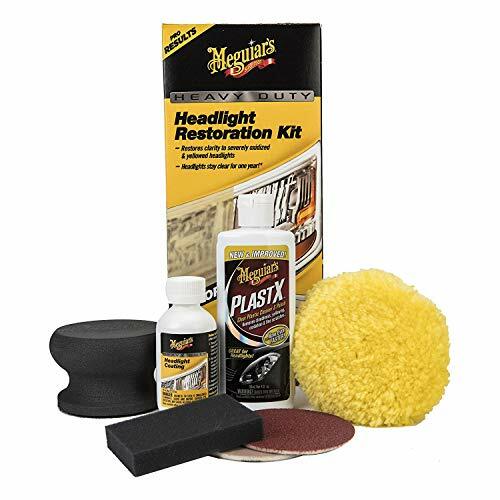 Living true to its name, the H&A Quick-E Headlight Restoration Kit is simple and easy to use. What I love most about this lens restoration kit is that you don’t need to use harsh abrasives and sandpaper. There is no need to employ tons of elbow grease, and you don’t need to use a drill either! 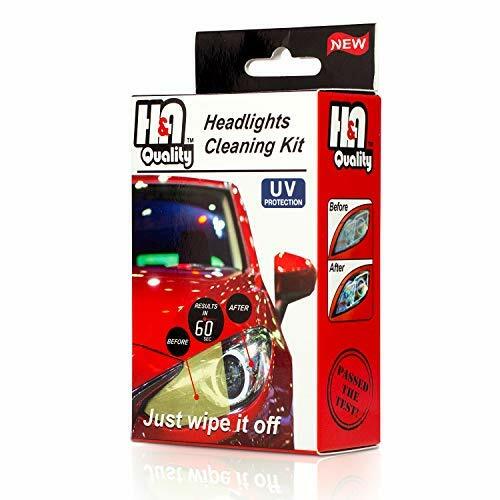 This product claims to clean and restore the clarity of dirty, scratched, yellowed, and dull headlights in about 60 seconds. The truth is the entire process will probably take you more than that, but the 3-step process is so easy that even women and kids can do it (no pun intended). The kit includes 2 cleaning cloths (one for each headlight), 1 drying cloth, 1 polishing cloth, and 1 protective glove. The process is nothing more than using the cleaning cloths to clean the lens, rubbing the lens with the drying cloth, and buffing the surface lightly with the polishing cloth. That’s all it takes. This product works well on mild to moderately oxidized headlight lenses. However, if your headlights are severely yellowed or oxidized, then you might look into the Sylvania or 3m kits. THE SYLVANIA STANDARD OF QUALITTY: With over 100+ years in business, Sylvania is the world leader in automotive lighting for Original Equipment Manufacturers (OEMs) and the aftermarket. It was a tough competition between the Sylvania and the TurtleWax kits. We recommended the TurtleWax mainly because it was half the price and restored our headlights just as well as the Sylvania product. However! If you want a lifetime warranty and don’t mind paying a little extra for the quality, grab this headlight restoration kit. 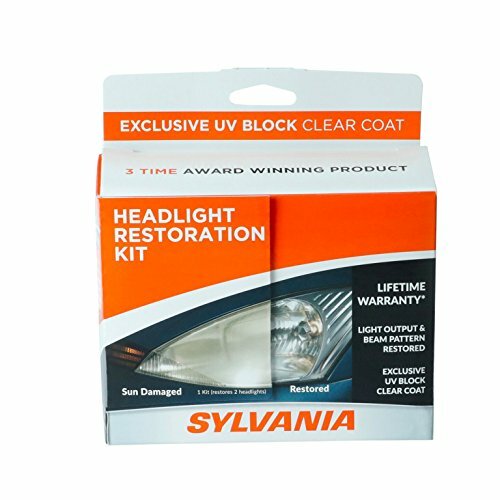 The SYLVANIA Headlight Restoration Kit is designed to fully remove the haze and oxidation from your headlight lenses. This product can restore the clarity and beam pattern of your old headlights so you can drive safely in the night. What I really like about this headlight restoration kit is that it employs an easy 3-step process to restore the clarity of the lens. Best of all, you don’t need power tools to complete the process. 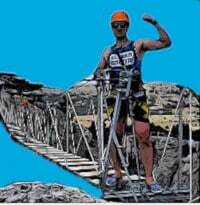 However, you will need a bit of elbow grease to get the job done more effectively. The process starts with the application of the surface activator. Simply wet the headlights and spray the surface activator until the headlights are completely covered with the solution. Let it soak for 30 seconds or more. You will immediately see the oxidation break down. Wash with water and prepare for the next step. The kit includes 400-grit, 1000-grit, and 2000-grit sandpaper. Wet sanding is highly recommended. First, use the 400-grit followed by the 100-grit and finish off using the 2000-grit sandpaper. Apply the clarifying compound then rinse with water. The final step is to dry the headlights completely and apply the UV block clear coat and you’re done. 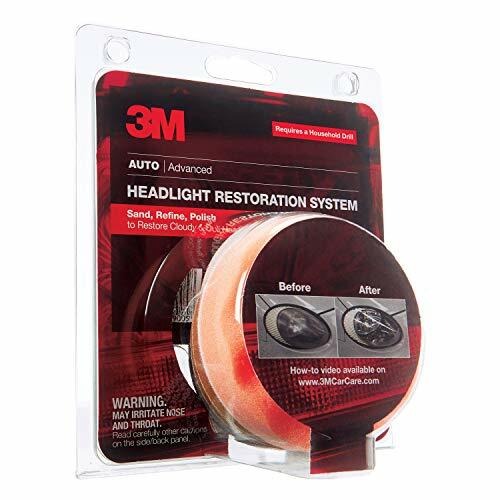 The 3M Lens Restoration System is not only good for headlights, it can also be used to clean and revive tail lights, fog lights, and the directional lights or turn signals in your car. While it’s not as quick and takes more elbow-grease than the Turtlewax or H&A kits, it can restore heavily oxidized headlights. This kit is designed to restore the condition of your headlights by safely removing oxidation. A minor caveat is that you need to use a corded drill. Of course, you can also use your hands and apply a bit of elbow grease, but using a drill is the preferred method when using the 3M Headlight Lens Restoration System. This kit includes a #M drill backing plate, a P800 grit white abrasive disc, P500 grit yellow disc, P3000 foam disc, orange foam compounding pad, and 1 0z. 3M headlight lens polish. The process starts by using the 500-grit disc to remove scratches and haze from the lens. Next, use the 800-grit disc followed by the 3000 wet disc. Finish it up by applying a small amount of the 3M lens polish. Let me say it upfront: the Meguiar’s Heavy Duty Headlight Restoration Kit is the most expensive product in this review. You will also need a corded drill. This kit includes 1000-grit and 3000-grit sanding discs, hand sanding pad, easy-buff wool pad, 4 oz. of PlastX, 2 oz. headlight coating, and a headlight coating applicator pad. The best part about this product is that it works well on severely deteriorated headlights, provided that you follow the directions carefully. It will not only remove the cloudiness or yellowing from the lens surface, but this product is also designed to smoothen out deep scratches for a like-new finish. The process is basically the same with the other products in this review. You will need to wet sand the lens using varying grit sandpaper. Next, use the wool pad to apply PlastX to polish the surface. Finally, apply headlight coating to seal the surface using the included applicator pad. The headlight coating is designed to protect the lens against further oxidation and yellowing for up to 12 months. Allow me to share the DIY headlight restoration solutions that my friend employed on his trusty old Civic. Before the advent of high-quality headlight restoration kits, the only recourse was to either remove the headlights from the vehicle and have it repaired at the body shop or to employ a couple of tricks on your own. Mind you, the process is basically the same, even with the availability of commercial headlight restoration kits. The process still entails a lot of sanding and elbow grease. On some restoration kits, you will need to use an orbital buffer or corded drill. But before we get to that, you might want to try these simple remedies using basic materials you can find in your own home. This method worked well for my friend’s Civic. It didn’t restore the headlights to a like-new condition, but it certainly helped clear up some of the fogginess from the plastic lens. All you need is a small amount of toothpaste and a small microfiber or terry cloth towel. Don’t use toothpaste brands with crystals or salt. In this case, plain white toothpaste will do. Simply apply a small amount of toothpaste on the cloth and rub it around the headlights. Make sure that every nook and cranny of the headlight is covered with toothpaste. Use small circular motions. After a minute or two of intense rubbing, you will already see a noticeable improvement. Lightly buff off the toothpaste from the headlight. Remove excess toothpaste with a clean cloth. You can repeat the process when necessary. Toothpaste contains mild abrasives to clean your teeth. Those mild abrasives are usually enough to remove mild oxidation from the headlights. Please take note that the toothpaste method might not work well in severely oxidized or yellowed headlights. If that’s the case, you can try the next method below. This method may sound unusual, but vinegar and baking soda is an old-school way of removing haze and oxidation on plastic headlights. Make sure that the headlights are clean and free of dust and dirt before proceeding. Mix a small amount of baking soda and plain vinegar in a small bowl until you have a paste. Apply the paste on the headlights using a terry cloth towel. Rub the paste lightly using small circular motions. Remove the excess with a separate cloth, buff lightly, and check the results. You can repeat the process if the headlights need further cleaning. Follow the instructions carefully. Most of these kits use a sanding method, and if the instructions recommends using masking tape to protect surrounding surfaces, then do it. Otherwise, you might end up harming the paint finish. It is good practice to remove the headlights from the front fascia when using headlight restoration kits. If not, then you should mask the surrounding areas with tape. You should work in an enclosed or shaded garage. Choosing the best headlight restoration kit will depend on the severity of the damage on your headlights. All the products in this review worked well provided that you follow the instructions included in the box. However, what really caught my attention was the Turtle Wax Headlight Lens Restorer and the H&A Quality Quick-E Headlight Restoration Kit. Both products were extremely easy to use, didn’t require the use of a corded drill, and came with a low price. They say that the eyes are the windows to the soul. In my humble opinion, the same goes true for the headlights in your vehicle. It doesn't matter if you have an old or new car, or if your vehicle was newly painted. If the headlights look old, dull, yellowed, or oxidized then your car will still look tired, no matter how much wax you apply to the finish or how much tire dressing is on the tires. So if you've got tired eyes, you're need to read our guide to choosing and using the best headlight restoration kit to restore the life to your lights! ✅How to Fix Oil on Spark Plug Threads: Why is there Oil on the Spark Plugs?